GLM Marine fully tuned design guides exhaust gases directly to riser without turbulence and back pressure that increases the engine performance up to 10%. 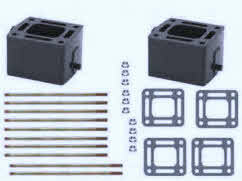 In addition the 40% more water cooling area will decrease the entire manifold body temperature significantly. P/N 51230 Exhaust manifold assembly - OEM 860246A10. 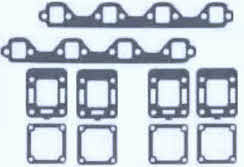 Can be used with 3 inch or 4 inch riser. P/N 39280 GM 305-350 cubic inch displacement 5.0-5.7 liter 198-270 hp. 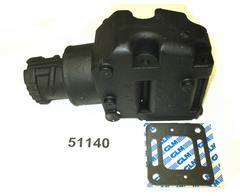 Fits log style manifold GM 305/350 cubic inch displacement. 5.0 liter and 5.7 liter with 198 to 270 HP. 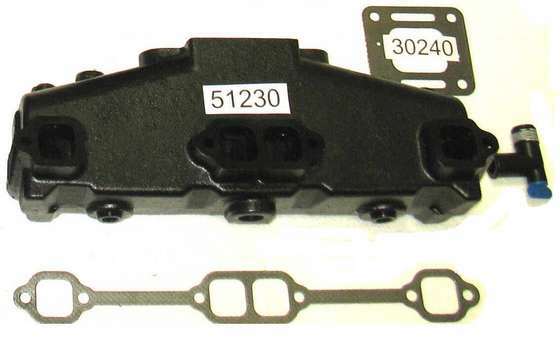 39880 GM 305-350 center riser manifold 200-320 hp. GM 305-350 engine with center riser manifold with 200 to 320 hp. 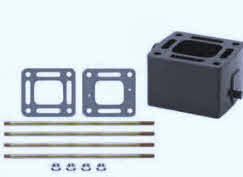 39880 GM 305-350 center riser manifold 200 and 320 hp. 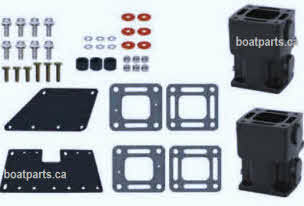 GM 305 / 350 cubic inch displacement with center riser manifold 200 and 320 hp. 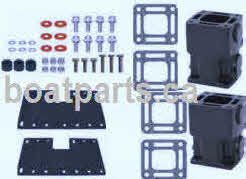 2001-2002 MIE and ski V8 with 350 and 377 CID MPI engines OEM 300000-31 6999 fits the above engines with cast iron elbows. 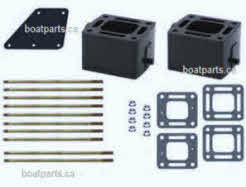 P/N 58232 Mercruiser complete V8 manifolds and 4" risers. 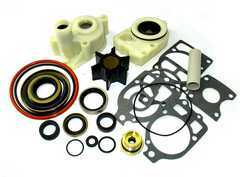 Set comes with hardware and gaskets. For port and starboard. 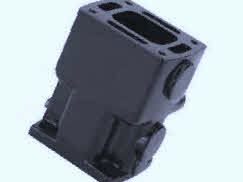 P/N 89120 Upper bellow OEM 32-44348T 4 inch center mounted riser to 4 inch elbow for (P/N 51140 shown below). All V8 engines have a firing order that fires two cylinders within 90 degrees of each other on the same bank of cylinders. With a firing order of 1-8-4-3-6-5-7-2, we have #8 and #4 firing on the starboard side of the engine within 90 degrees of crankshaft rotation. 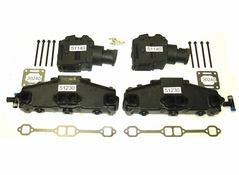 On the port side, we have #5 and #7 firing within 90 degrees of crankshaft rotation of each other. Of course, this also means that the exhaust gases for these cylinders immediately discharge into the exhaust manifold one after the other. At this point, when the two cylinders fill the manifold in immediate succession, the exhaust manifold becomes overwhelmed with exhaust gases, creating excessive back pressure. In fact, excessive back-pressure from an overwhelmed exhaust system will not only keep spent gases from leaving the cylinder head exhaust port, but in certain ports, exhaust gases from adjacent cylinders may find their way back in. 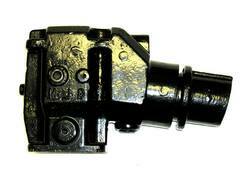 The solution is to isolate each exhaust gas pulse for as long as possible in the exhaust manifold. There are aftermarket manifold manufacturers that go to great lengths to isolate each exhaust pulse the full length of the manifold, and there are some that barely address the problem at all. Choosing a high performance manifold that isolates each runner is the key to building horsepower with the exhaust system. If properly designed, it can achieve this by two ways: Separating Exhaust Gas Pulses and Lowering Back Pressure. Because the starboard side of the engine fires #4 and #8 in succession, there is a cylinder (#6) separating the two. Dividing this manifold into two different sections by grouping #2 and #4 in the front half of the manifold and #6 and #8 into the back half of the manifold works relatively well in isolating the #4 and #8 cylinders. On the port side of the engine we have a problem: The #5 and #7 cylinders that fire in succession are next to each other. Dividing the port manifold into a front half and a back half groups cylinders #1 and #3 together (which is okay), but groups #5 and #7 together (which is definitely not okay). This is exactly what we are trying to prevent! 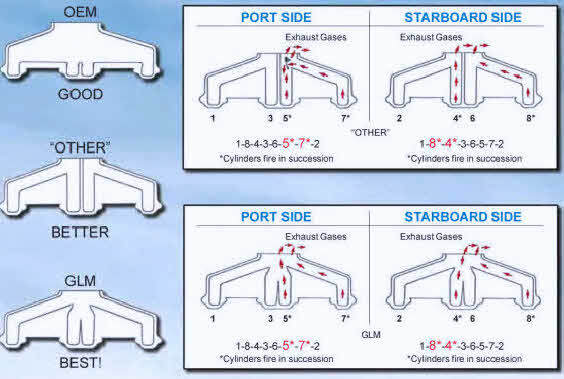 The correct way to build the port side manifold is to isolate the exhaust gases from cylinders #5 and #7 all the way to the manifold exit. 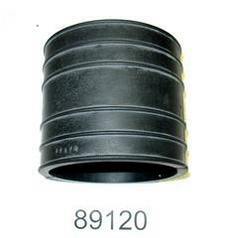 Lowering back pressure in the exhaust manifold is a combination of isolating the exhaust pulses as discussed in the previous section, and simply making the exhaust system larger. 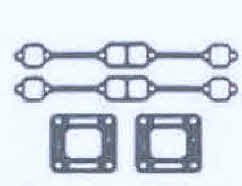 Some techniques for lowering back pressure include: large passages in the exhaust manifolds, a large exit hole out of the manifold, a large exhaust pipe and large radius curves in the pipe wherever the exhaust gases have to change direction. That fires two cylinders within 90 degrees of each other on the same bank of cylinders. With a firing order of 1-8-4-3-6-5-7-2 we have #8 and #4 firing on the starboard side of the engine within 90 degrees of crankshaft rotation of each other. Of course, this also means that the exhaust gases for these cylinders immediately discharges into the exhaust manifold one after the other. It is at this point, when the two cylinders fill the manifold in immediate succession, that the exhaust manifold becomes overwhelmed with exhaust gases, creating excessive back pressure. In fact, these two cylinders on each bank firing in succession, not only create excessive back pressure in the manifold, but all the way down the exhaust pipe. Excessive back pressure from an overwhelmed exhaust system will not only keep spent gases from leaving the cylinder head exhaust port, but in certain ports, exhaust gases from adjacent cylinders may find their way back in. 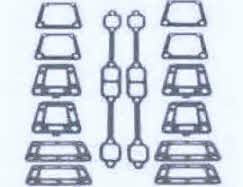 The solution is to isolate each exhaust gas pulse as much as possible for as long as possible in the exhaust manifold. 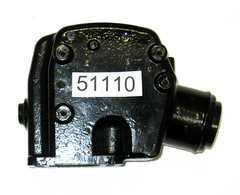 There are aftermarket manifold manufacturers that go to great lengths to isolate each exhaust pulse the full length of the manifold and there are some that barely address the problem at all. 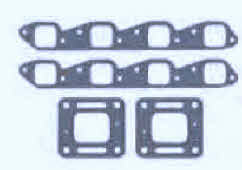 Because the starboard side of the engine fires cylinders 4 & 8 in succession, there is a cylinder (#6) separating the two. Dividing this manifold into two different sections by grouping cylinder #2 and #4 in the front half of the manifold, and #6 and #8 into the back half of the manifold with a divider, works relatively well in isolating cylinders #4 and #8. On the port side of the engine, we have a problem. The cylinders that fire in succession, 5&7, are next to each other. Dividing the port manifold into a front half and back half groups cylinder 1 &3 together (which is okay) but also groups cylinder 5&7 together (definitely not okay). This is exactly what we are trying to prevent. The correct way to build the port side manifold is to isolate the exhaust gases from cylinders 5&7 all the way to the manifold exit. This can not be done with a simple divider in the middle of the manifold. Lowering back pressure in the exhaust manifold is a combination of isolating the exhaust pulses as discussed in the previous paragraph one. Simply making the exhaust system larger. Large passages in the exhaust manifolds, a large exit hole out of the manifold, a large exhaust pipe and large radius curves in the pipe wherever the exhaust gases have to change direction are the secrets to lowering back pressure.